Whether you're at home or in the classroom, there's always a need to teach about personal hygiene. But it's one thing to talk about it and another to provide resources that show kids exactly how to take care of themselves. This is what the NEW Montessori-inspired Self-Care: Personal Hygiene Printable Pack is all about! It empowers kids to become independent in tasks such as washing hands, blowing their nose and washing hair. This printable pack also teaches children how to solve personal hygiene problems in two Montessori-inspired printables. The Montessori-inspired Self-Care: Personal Hygiene Printable Pack is a must have in the classroom and at home. Let's talk more about details. This printable pack is 16 pages full of beautiful images of children that are diverse to meet the needs of any classroom. It is designed for children in Montessori preschool and elementary classrooms and homes. I introduced the resources in this printable pack to children in my home and classroom over the last two days and they all went nuts over them. Trust me when I say this is a resource you need! Currently, the Montessori-inspired Self-Care: Personal Hygiene Printable Pack is part of the Montessori-inspired Self-Care Bundle. The Montessori-inspired Self-Care Bundle is a 300 page resource created for Montessori preschool and elementary children at home and at school. Purchased at full price, this resource costs $60. But for a limited time you can receive this fantastic resource for only $14.99! This is only possible through Wednesday, April 17th at 11:59 PM, so don't wait! 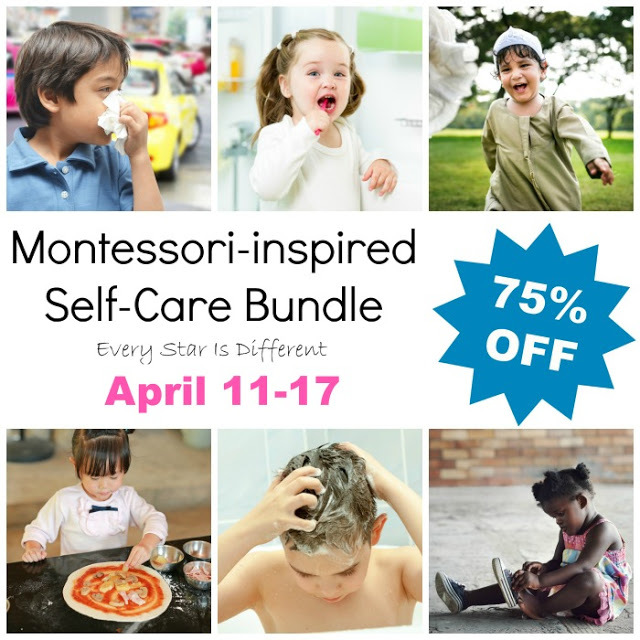 Grab your Montessori-inspired Self-Care Bundle today! I really can't say enough about this resource! Everyone who has seen it LOVES it! Now if you're still hesitant about the product, I want to be sure you're able to see first hand just how amazing it is by giving you a bonus subscriber freebie to try out. All of these resources go hand in hand with what's in the printable pack. 4. You will be sent a confirmation e-mail. Be sure to click the link to confirm your subscription. 5. Once confirmed you will receive a "Thank You" Message. 6. The link to our Subscriber Only Freebies page as well as password to access it is in the "Thank You" message. 7. Click on link and type in password. 8. Find the printable pack you are looking for listed in alphabetical order, click on it, and viola! We hope you enjoy all of these wonderful resources! Don't forget to purchase your Montessori-inspired Self-Care Bundle today before it's too late! So many children struggle with caring for their teeth properly. Some children aren't taught properly or decide not to listen when they are. Others have sensory aversions to the cleaning process. Dentist appointments can be a nightmare. No child fully understands the consequences of not caring for their teeth. 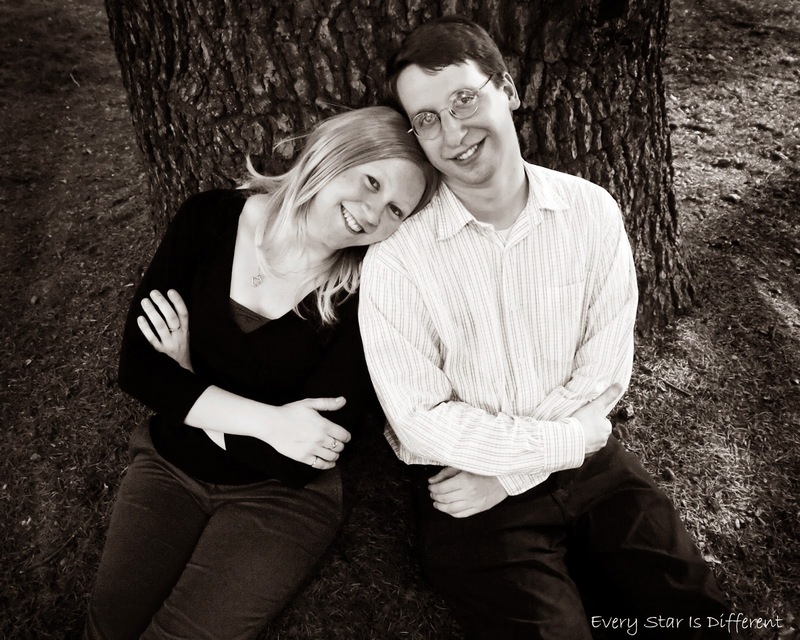 Parents can often become frustrated and quite desperate for helpful resources to use at home. Teachers also share concern when it comes to dental hygiene. Children may show up at school with bad breath and food items stuck in their teeth. Caregivers may or may not be able to teach and provide for children in the home. And those who are able to teach and provide may not be listened to. The more we can educate children about the importance of dental hygiene at home and at school, the better their chances are of having healthy smiles when they are older. 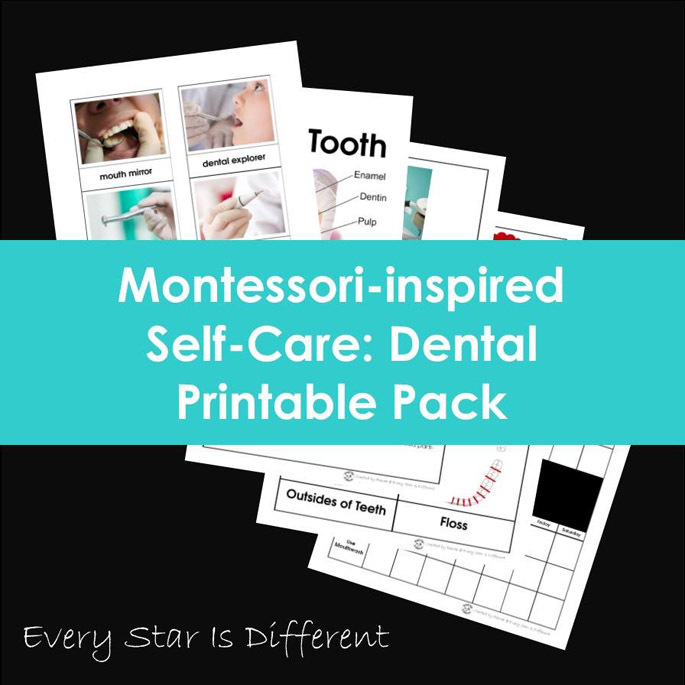 This is the main purpose of the Montessori-inspired Self-Care: Dental Printable Pack! 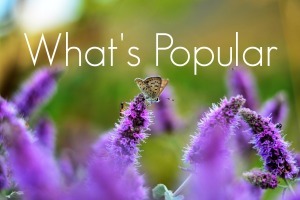 It is the perfect resource for the home and classroom! As mentioned in a previous post, we have four new students in our classroom this year. They love to sleep in and most often arrive just after waking up in the morning. We serve breakfast as part of our daily schedule and then provide everything they need to care for their teeth: toothbrush, toothpaste, floss, and mouthwash. It's part of our daily routine at school. If everyone is doing it, no one will feel uncomfortable during the process. Sometimes the kids get lazy and decide to skip important steps in the teeth cleaning process. Some of my kiddos do the same thing as well. Sunshine tends to only brush her front teeth. Bulldozer forgets to brush all together as he often is distracted by other more pleasurable tasks. Princess forgets mouthwash if she's in a hurry. Every child I know could use some visual reminders to help through the process. 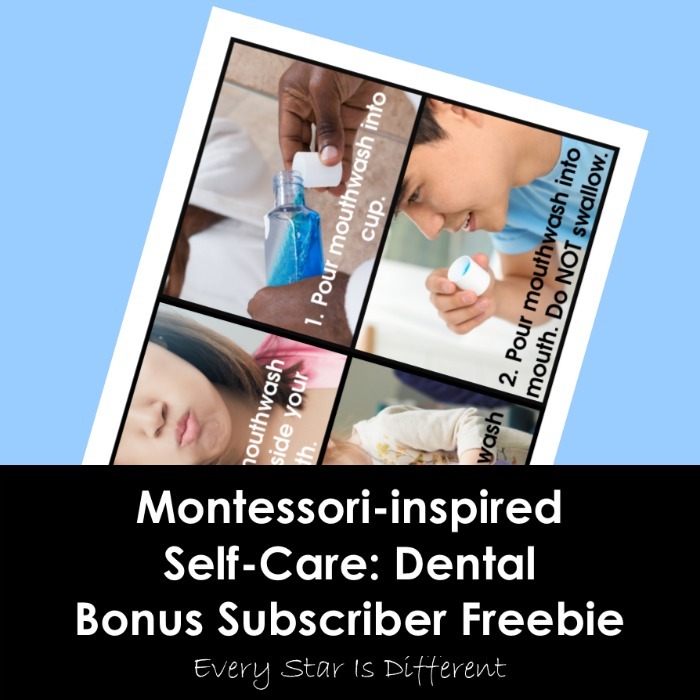 The Montessori-inspired Self-Care Dental Printable Pack provides them and so much more! I don't know of a single child who loves going to the dentist. Appointments can often be scary and cause extreme anxiety. This doesn't have to be the case though. What if you had the proper materials to educate children about what a dentist appointment is like? The Montessori-inspired Self-Care Dental Printable Pack does just that! Whether you're looking for sequence cards, a social story, or dental tool nomenclature cards, this pack has it all! You may wonder how we could give you all of this? The father of the students I teach is a dentist! He helped me put this all together. We then confirmed it all with a second dentist we know in town. I assure you this printable pack is top notch. The Montessori-inspired Self-Care: Dental Printable Pack is 72 pages in length. It is designed for children in Montessori preschool and elementary classrooms. This printable pack includes so many activities! The Montessori-inspired Self-Care: Dental Printable Pack is only one part of the amazing 300 page Montessori-inspired Self-Care Bundle! Alone at full price the 72 page Dental Printable Pack costs $14.50. Now through Wednesday, April 17th you can purchase the entire Montessori-inspired Self-Care Bundle for only $14.99! You're receiving 300 pages of printables for the nearly the cost of only 72 pages. Just check out all that's included! You don't want to miss out on this! Trust me! 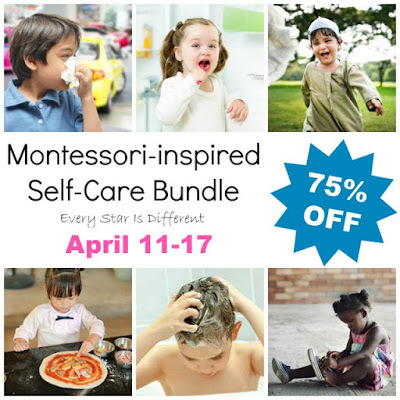 Purchase your Montessori-inspired Self-Care Bundle today!!! And while you're at it, be sure to download our Self-Care: Dental Bonus Freebie by following the directions below. It's the perfect visual resource to teach children how to use mouthwash. This printable is not included in the dental pack or self-care bundle, but is a preview of the quality of our work and just how detailed it is. 3. Open the thank you message you receive after subscribing. (Be sure to check your spam folder, as sometimes it ends up there.) Click on the link to confirm your subscription. 4. Once your subscription is confirmed you will be given a link to the Subscriber's Only Freebies along with the password via e-mail. We hope you enjoy the printable and don't forget to purchase your copy of the Montessori-inspired Self-Care Bundle! The Montessori Practical Life curriculum includes many kitchen tasks that children learn and master at home and in the classroom. Preparing meals and navigating the kitchen are skills that will benefit children their entire lives. So why is it that unlike language, math, science, geography and history, there are little to no resources to help children learn these skills? How many kitchen utensils do we use on a daily basis that have special names children need to learn? How many vocabulary terms are in recipes that children don't know? When do we begin to start teaching children how to follow a step-by-step recipe? What if they have the desire to learn before they can read? How can we help children be independent in the kitchen? 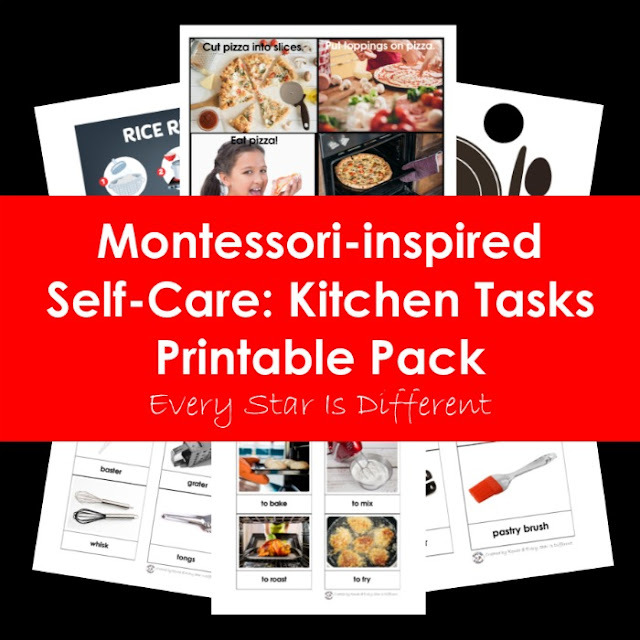 The Montessori-inspired Self-Care: Kitchen Tasks Printable Pack is the answer! This printable pack is 29 pages long. And for a limited time the Montessori-inspired Self-Care: Kitchen Tasks Printable Pack is part of the Montessori-inspired Self-Care Bundle! This bundle includes 300 pages of unbelievable printables to help children master self-care practical life skills. At full price this bundle would cost you $60. But now through Wednesday, April 17th at 11:59 PM EST it can be yours for an incredible $14.99. Don't wait until it's too late to grab your own Montessori-inspired Self-Care Bundle! 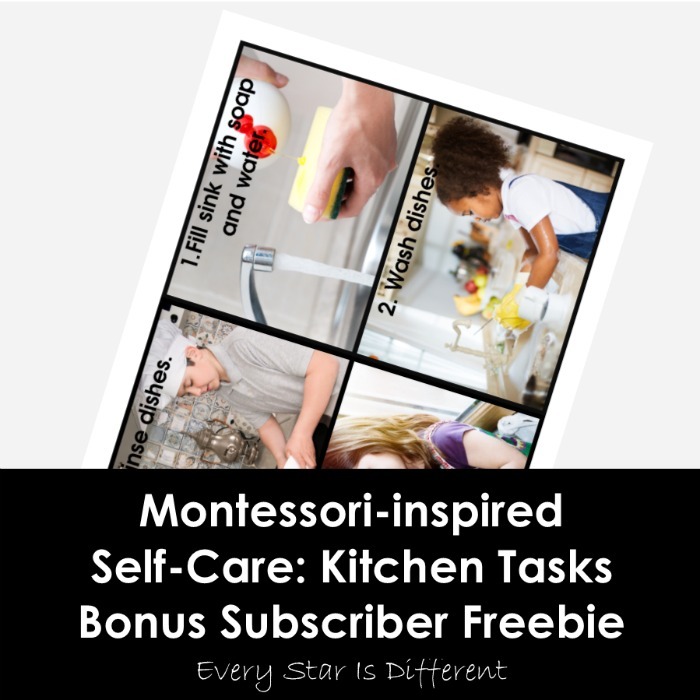 If you're still unsure and want to preview how amazing the Montessori-inspired Self-Care Bundle is, or you want to take advantage of another one of our fantastic subscribers only freebies, be sure to download the Self-Care: Kitchen Tasks Bonus Freebie below! This "how to do dishes" printable with options for hand washing and dishwashers is not included in the Montessori-inspired Self-Care: Kitchen Tasks Printable Pack or the Montessori-inspired Self-Care Bundle. It is an exclusive subscriber only freebie designed to go along with everything you're already receiving. Be sure to download your Self-Care: Kitchen Tasks Bonus Freebie today following the directions below! And don't forget to grab your Montessori-inspired Self-Care Bundle today! It will disappear after Wednesday, April 17th and you will have to buy the individual printable packs at full price. We hope you enjoy this bundle as much as we do!